A landscaping challenge that many homeowners face is drainage. For homeowners and cottage owners in the Muskokas, this is especially important considering that 1,600 of Canada’s lakes are at home within their borders. Many yards have insufficient drainage options, and land in the Muskokas is unique, being the transition place from the northern boreal forests to a more mixed southern forest. With sandy, shallow soil that sits atop bedrock, rainwater can end up pooling in yards if it is not properly siphoned. There are a lot of different ways to help improve the drainage on your property to protect your home or cottage, and one attractive way to tackle it is with a human-made dry creek bed. A professional excavation company is your best bet if you want to create a dry creek bed for the purposes of drainage. If you’re going to put a simple dry creek bed in for aesthetic purposes, then you can handle it on your own, but if you are trying to protect your home or cottage then hiring the experts to get the job done right is crucial. You don’t want to accidentally direct water towards your home, septic tank, or not create enough of an incline and end up with water pooling. A professional team will start with mapping out the direction and slope of your new river bed. Curving courses are more natural looking than straight courses and can help slow down rushing water from torrential rains. The dry creek will have a “headwater” sometimes this is from a drainage pipe that drains onto your property, other times it is merely where most of the water collects. A great thing that landscapers can do is try and disguise the “headwater” so that the creek appears more natural and not human-made. Boulders are great options for this. 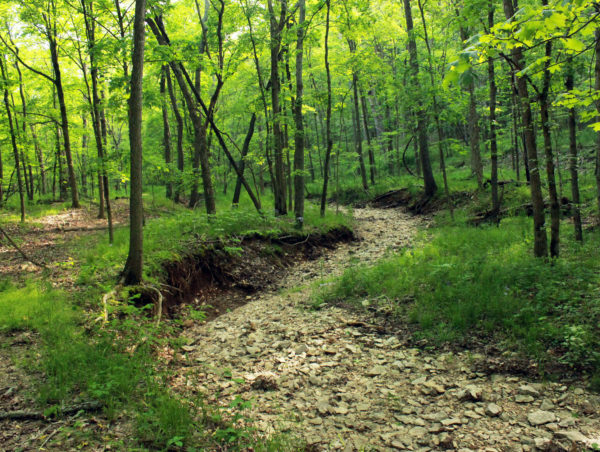 While some creeks that naturally occur are quite deep, a landscaper is not usually going to recommend a deep dry creek bed as it can be a hazard when it is dry. Instead, it will be wide to accommodate the flow of water and to make it traversable while it is dry so that there are no accidents. The creek then needs to be dug out, landscaping fabric must be laid down the length, and rocks must be laid inside. This is partially for the structure of the creek bed and partly for aesthetics. A great landscaper will make it look great. If you have a very steep hill, then you may need your rocks mortared down. At Schlager Excavating we provide landscape design that is practical and beautiful. Our landscape plans for house landscaping or your cottage property are well thought out and will make your property stand out. Browse our gallery today and become inspired.